Blues woman Vera Hall's "Trouble so hard" was remixed by Moby on his single, "Natural Blues"
Bluescentric's officially licensed Bo Diddley t-shirt is available in premium lightweight 4.2oz vintage style sizes up to 4XL. Solid colors are 100% combed, ringspun cotton. Athletic Heather is 90% cotton. All other Heather colors are 52% cotton, 48% poly. Sizes run true. These t shirts are lighter and slightly more fitted compared to the Classic Gildan tees. 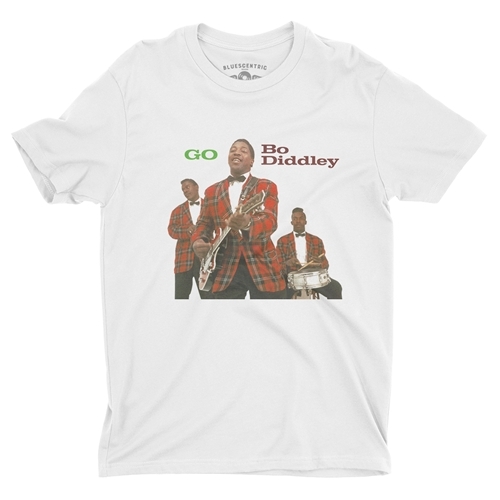 Bo Diddley's second album, Go Bo Diddley, was released in July of 1959 on Chess subsidiary Checker Records. An all-star band backed Bo up. Peggy Jones sang backing vocals and played guitar, Jerome Green on maracas. Willie Dixon played bass, Billy Boy Arnold was on harmonica, and Otis Spann played piano.